British sailor. Nephew of the novelist Captain Frederick Marryat. 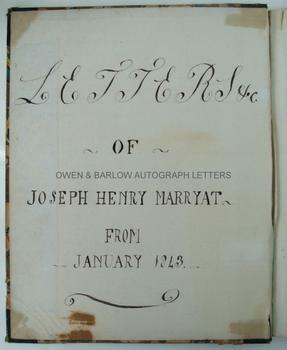 The letter book contains Joseph Marryat’s own copies of letters written by him to his parents and others and also letters received by him or copied to him. In addition to Marryat’s letters, the book contains several copy letters of Captain Sir Edward Belcher. The entries commence on November 6th 1842 and continue to October 20th 1845. Together they give a full and detailed account of his entry into the Royal Navy as a young midshipman, serving on H.M.S. Samarang under Captain Belcher on the China Station. Marryat was only 12 years of age (the youngest age then allowable by law for service on ships of the Royal Navy) when he joined the ship and was still aged only 13 when promoted to sub-lieutenant during the voyage. The letters are a very rare and remarkable account of the life of a young age of sail midshipman in the first half of the 19th century. The historical context of the letters is an important one as Belcher had had a prominent role in the war against China (the first opium War, concluded by the Treaty of Nanking in 1842, which granted an indemnity to Britain, the opening of five treaty ports, and the cession of Hong Kong Island, thereby ending the trade monopoly of the Canton System. ) Belcher had made the first survey of Hong Kong harbour and, immediately following the war, he undertook in H.M.S. Samarang further important survey works designed to strengthen Britain’s naval power and influence in the region. The first letter, dated November 6th 1842, was written by Marryat to his father whilst he was still at school at Twyford. He says he still wishes “to be a sailor and do prefer it above every profession”. He considers the hardships and the chances of death but says “if Providence wishes you to die, you may just as well die at sea”. They continue with correspondence from the Admiralty, including the need to produce proof that he has reached the age of 12, his examination by the Commander in Chief at Portsmouth, efforts made by his tutor Robert Wickham to improve his mathematics. He sets sail on H.M.S. Samarang, headed for the China Station and writes various letters to his mother or his father en route from various ports, including Falmouth, the Cape, Singapore, Singapore Roads, Sarawak, Borneo, Hong Kong, Macau, Manila and at sea. The content of the letters is detailed and remarkably mature considering his age and includes accounts of his life aboard ship, his duties, events on shore, survey of the coast of Borneo, pirates, encounters with the Chinese and other foreign persons and officials, etc. 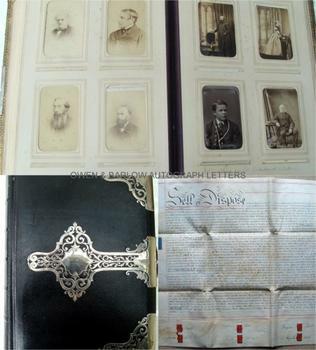 The letter book also includes the copy letters of the commander of H.M.S. Samarang, Captain Belcher, to his niece, Maria and Joseph’s father Charles Marryat (the families were related by two different marriages, both Joseph and Charles Marryat marrying into the Belcher family). 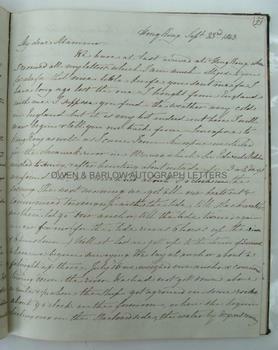 These too are extraordinary and detailed letters, full of fascinating content, such as the ship’s adventures in Borneo and Sarawak, fighting pirates with the Rajah in the mouths of the rivers, surveys and efforts to claim and establish lands rich in resources as British settlements, reports of white women being abducted and held captive, etc. 4to. 77pp of letters and a 1p ship’s itinerary. Original roan backed marbled boards. Somewhat rubbed and worn but the contents are generally in fine condition. 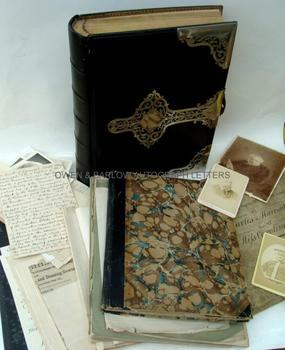 We include with the letter book a small archive of other Marryat family papers, including correspondence referring to the letters, a large legal document on 6 vellum sheets being Charles Marryat’s marriage settlement of 28th June 1826 with his first wife, Caroline Short and bearing numerous signatures, seals and endorsements, various genealogical materials relating to the Marryat family, an album of cuttings, invitations, dinner menus, etc relating to the family, an album of carte de visite and other Marryat family photographs, a typed transcript of entries from Charles Marryat’s journals 1802-1874, prepared from the original manuscripts by Gerald Marryat and transcribed in 1954 by Helen Marryat, a transcript of Captain Frederick Marryat’s correspondence with the admiralty, etc. Joseph Henry Marryat served on H.M.S. Samarang with his cousin, Senior Midshipman Frank Samuel Marryat, the son of the novelist Captain Frederick Marryat. During the voyage there was an acrimonious dispute between Frank Marryat and Captain Belcher, which led to Frank Marryat leaving the service and the final quarrel between his father, the novelist Captain Frederick Marryat, and the Admiralty, which marred the last years of his life. A supposed autobiographical account of the ill-treatment of Frank by Belcher was once thought to be fiction penned by Marryat as an intended final chapter of a novel but the event was, in fact, one that was only too real. This letter book throws some light on the affair and contains references to the arguments during the voyage. Included with the papers are a typescript copy of the tirade against Belcher and correspondence between researchers and members of the Marryat family concerning the affair. Joseph Henry Marryat was born in 1830. He entered the Royal Navy as a volunteer midshipman in 1842 and was promoted sub-lieutenant in 1843 and full lieutenant in 1852. He distinguished himself by his gallant actions during the Crimean War in the naval attack on the Russian forts, when Marryat (then a lieutenant on H.M. S. Cracker) laid buoys through the treacherous approaches whilst under heavy Russian fire. As a result he was promoted to Commander in 1855 and received the Turkish and Crimean medals with Azof and Sebastopol clasps and was made a Knight of the Legion of Honour. He was made a retired Captain in 1870 and was promoted to Rear Admiral on the retired list of 1881. HMS Samarang was a 28-gun, teak, Atholl-class full-rigged ship of the Royal Navy. She was launched at Cochin in 1822 by the East India Company. She served in various stations around the world until seeing action in the First Opium War, and was then employed, under Edward Belcher, in surveying the coast of Borneo from 1843-1846 after which she became a guardship at Gibraltar before being sold for breaking in 1883.